A focus on off-road trails, community, cycling and a current feasibility study were highlighted in the seventh Annual General Meeting of the Friends of the Bendigo-Kilmore Rail Trail held on 18 October 2016. Outgoing President Garry Long spoke of a past year where a major milestone occurred for both the O’Keefe Rail Trail and the Friends of the Bendigo-Kilmore Rail Trail. The 49kms long continuous O’Keefe Rail Trail was officially opened, linking Heathcote, Knowsley, Axedale, Junortoun and Bendigo. Mr Long spoke of the contributions that the members had made to assist City of Greater Bendigo Council in its role as project manager and trail manager during the year, all in a volunteer capacity. Also mentioned was the support provided to the Friends group by community organisations and companies, which included direct donations and grants from the Heathcote Lions Club, Strathfieldsaye and Districts Community Enterprise, CVGT Australia, Mandalay Resources P/L, City of Greater Bendigo Council, as well as from the Friends group’s own raised funds. 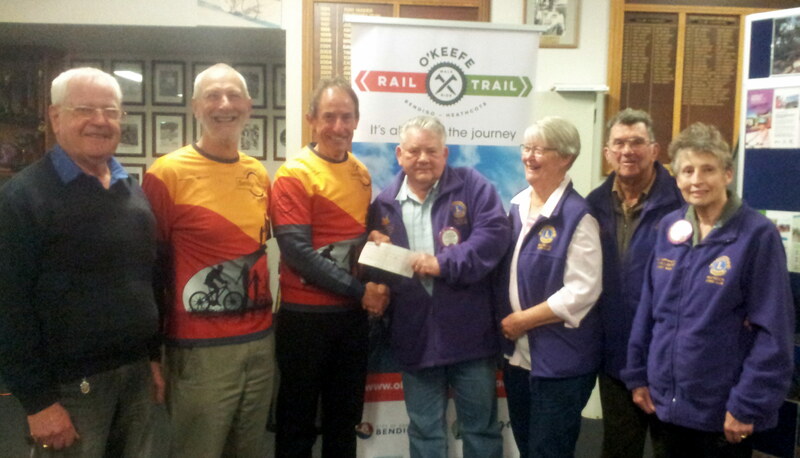 Daryl Dedman, Heathcote Lions Club presents a cheque to Friends President Garry Long, for the purchase of two O’Keefe Rail Trail table-seat units. AGM 18 Oct 2016. With the support from Jacinta Allan, the member for Bendigo East, Victorian State Government, Mitchell Shire Council, and City of Greater Bendigo Council, such has enabled a funded feasibility study to be awarded and currently being conducted for the Wallan to Heathcote Rail Trail proposal. The study’s consultants RM Consulting Group representatives were guest speakers at the AGM, and they indicated the progress to date plus what is proposed for completion of the study. The Friends Executive for 2017 is President – Garry Long, Vice President – Les Lewis, Secretary – Mal Ward and Treasurer – Colin Campbell.